New Zealand is an area world renowned for its natural beauty. Indeed most tourists go to witness the majesty of the snow topped mountain ranges. But sometimes the most beautiful things to see are the ones which many people don’t really think about, which is why this article will be focused on The Lakes and Hot Springs of Rotorua. Rotorua is home to some of the most scenic lakes in New Zealand. The name Rotorua originates from the native Maori language, translated it means ‘Second Lake’ or ‘Crater Lake,’ appropriate as the main lake was formed from the crater of an ancient volcano. The waters are often a beautiful vibrant blue and are encapsulated within massive mountain ranges. Mount Tarawera is particularly imposing as it looms over the country side. The city is located on the North Island, around a three hour drive south east of Auckland. The area has a plethora of hotels and restaurants, so you’ll never be left wanting. Prices range from low to high and all that is in between. We suggest that you get a hire car so that you can easily travel around the city and the surrounding country side; it is well worth the extra cost. The biggest lake of Rotorua is the aptly named Rotorua Lake. 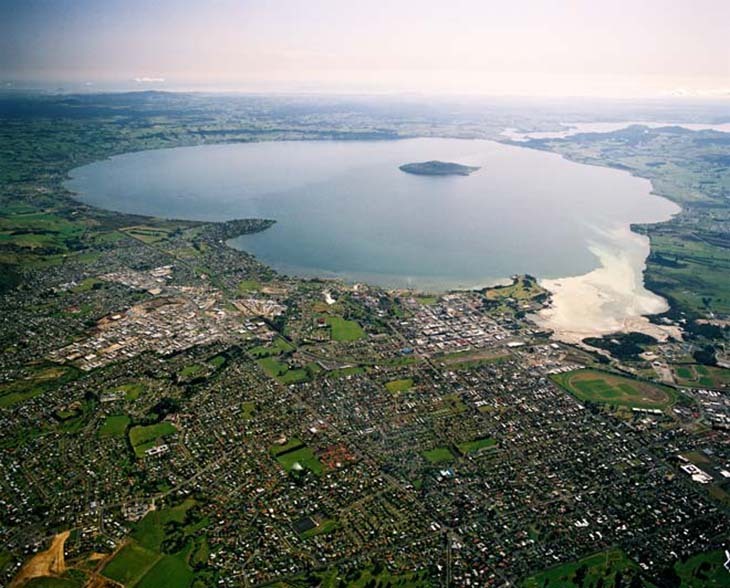 The lake is located directly opposite the city, and in fact you can see it from most areas of Rotorua. Surrounding the lake are the main highways and roads which take you all over the New Zealand country side. It’s suggested that you avoid the winter months as much as possible in New Zealand, as it can get extremely cold, especially when staying near the Lakes. Travel around December to February for the best chance at staying warm. The lake can be toured by boat or you can take the highways to see the full perimeter. If you travel to the Northern end of the lake Mt. Tarawera provides a spectacular backdrop. We suggest that you stay close to Lake Rotorua and use it as your hub for travelling to the other lakes. The Regent of Rotorua is a great hotel to stay in, offering the most comfortable stay in Rotorua, with great access to the rest of the city. 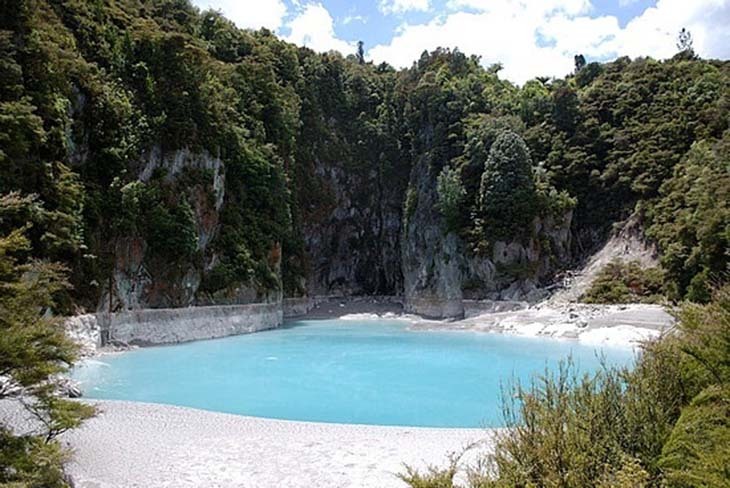 There is more than just Lake Rotorua though, the smaller lakes of Rotorua; Lake Rotokakahi or the Green Lake, are especially beautiful due to their natural coloured waters. The Green Lake is especially stunning; with green waters caused by a large amount of vegetation and low to the ground water level. Lake Rotokakahi or the Green Lake is naturally stunning. Lake Tarawera, another small lake is unsurprisingly located close to Mt Tarawera. This lake is particularly popular with fisherman for the rainbow trout that inhabit the area. However all year round the lake teams with tourists wanting to relax in the nearby hot water beaches caused by the volcanic activity of the mountain. Lake Tarawera offers magnificent views of the mountain and more. Most of the hot water springs in Rotorua are run by local businesses, which provide day treatments for customers to sit back and relax. The springs are powered by the local geothermal activity, which also leads to the numerous geysers around the countryside. We recommend The Polynesian Spa for your relaxation needs. The spa has both a mineral pool and spa therapies, which suit everyone from couples to families. All you need to do is sit back and let the hot water melt away all of the tension in your limbs. The Geysers of Rotorua are well worth a visit, the Pohutu Geyser being the most famous. This Geyser shoots water up to 30 metres into the air, up to 20 times a day. The geothermal energy required for geysers to form is exceptionally rare, making this visit all the more important. From Rotorua, the trip to the Pohutu Geyser takes about 5-10 minutes by car, and the same by bus of which there is a constant service. The Geyser operates all year round with no time of the year being better than another. There are even hotels and holiday inns situated close to the geysers for those who want to experience their continuous majesty.